Preprinted with spaces for important information. Space for imprint on customer tear-off stub. Reinforced eyelet, strung with white twine. Does your system for keeping track of repair work need a bit of repair itself? 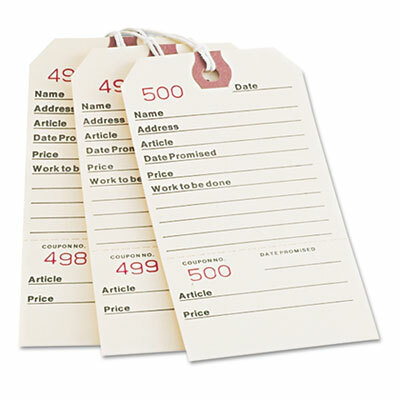 These tags are simple to use but deliver big convenience. Comes preprinted with spaces for important information, including the name and address of the owner, work to be done and date promised, and store imprint or stamp, plus a detachable coupon on the bottom. Reinforced eyelet, strung with white twine. Durable, easy-to-read cardstock.